(Newser) – Folks on Sesame Street have a way of making everyone feel accepted. 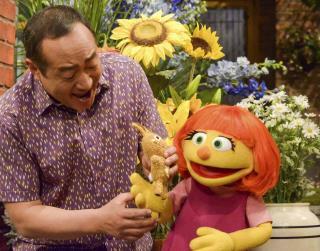 That certainly goes for Julia, a Muppet youngster with blazing red hair, bright green eyes—and autism. Rather than being treated like an outsider, often the plight of kids on the spectrum, Julia is one of the gang, reports the AP. On this friendliest of streets, Julia is about to play a game with Oscar, Abby, and Grover as these Muppet chums have been challenged to spot objects shaped like squares or circles or triangles. "You're lucky," says Abby to Grover. "You have Julia on your team, and she is really good at finding shapes!" Joining her pals, Julia (performed by Stacey Gordon) takes off in search. "We're modeling the way both children and adults can look at autism from a strength-based perspective: finding things that all children share," says a Sesame Workshop exec. Since Sesame Street loves to preach diversity and harmony within society, when will they introduce a muslim character? It could be a little character in a burqa. Complaining about extremism within Islam,Sharia Law, concubines, inequality and being chaperoned 24/7. I suppose I'm in the minority. I never thought that Sesame Street was good for kids. I was never a fan of puppets or of people dressed up as puppets when I was a kid Too silly, only Sesame Street is serious about it. Confirmation that President Trump is doing the right thing by cutting funding to CPB which has become yet another Democrat organ.